With all of the data constantly flooding our screens, sometimes we need ways to make sense of what we’re seeing. That’s where data visualizations can come in handy – and in an industry like security, where it’s key to spot data showing an attack on a system, it can be crucial. Enter Nuix, a data discovery company based in Australia. Launched in 2000, the company has focused on allowing people to sift through unstructured data and to make correlations between data sets, but more recently, it’s been working on products and services to protect the security of that data. 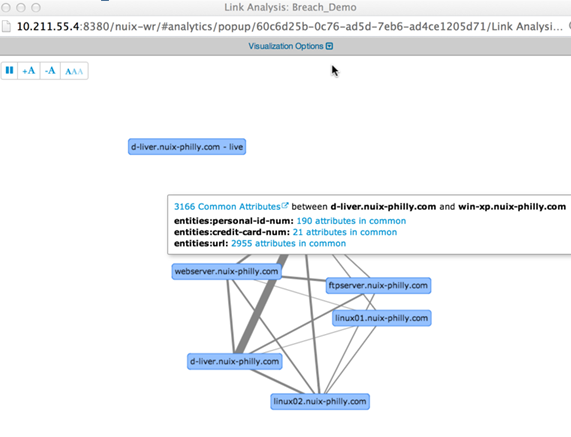 In June, Nuix launched its Web Review and Analytics product, which melds data visualizations and cybersecurity into one tool. The goal of the tool is to allow investigators to quickly spot potential threats through seeing anomalies or spikes in a data visualization. “One of the functions in Web Review and Analytics is to enable lower-skilled, lower-experienced investigators to still be effective with a tool set. They can still spot anomalies, they can still spot traffic patterns, they can still look at file architecture and file types through a different interface, but then they can go, OK, now I need to drill down and figure out these anomalies here,” says Chris Pogue, senior vice-president of cyber threat analysis at Nuix. Formerly a director at Trustwave’s Spider Labs, Pogue has been at his new post since June. The Web Review and Analytics tool is also handy as an educational tool, Pogue adds. Showing a non-technical manager a potential threat can be difficult without using a visual aid like one of the tool’s data visualizations, some of which are designed to be simple enough for laypeople to understand. Many of Nuix’s customers for Web Review and Analytics include financial services companies, law enforcement, and legal firms. However, Nuix is looking to promote the tool within industries like hospitality, food and beverage, and other verticals where businesses need to analyze a lot of data. Aside from simplifying threat data, Web Review and Analytics also incorporates real-time threat intelligence from Pogue’s team of researchers. Since arriving at Nuix, he’s built a team of people who understand incident response tactics, malware, and penetration testing, and the team will add data on potential threats to the Web Review and Analytics tool. In Pogue’s mind, this kind of repository for threat intelligence is just going to grow more important within the security industry.